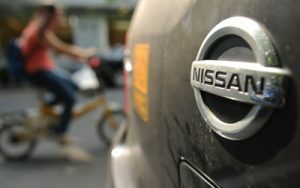 Nissan, the Japanese automaker, reduced its profit forecast for the full year as a scandal involving safety inspection hit its earnings. The automaker is expecting its operating profit to be 645 billion yen or $7.5 billion for its year ending March 2018, which is down from its guidance released previously of 685 billion yen. It also experienced a sharp fall in its operating profit for its quarter that ended in September due to weakness in its U.S. market. It recalled 1.2 million vehicles in its domestic market in October, after flaws had been found in safety checks that were made. During its media briefing on Wednesday in Yokohama, CEO at Nissan Hiroto Saikawa bowed in apology and made the promise to regain trust following the safety check scandal. The Nissan CEO said that he would like to express his apologies to the company’s customers, its business partners, dealers as well as all the different people that have supported Nissan. Nissan, the second largest Japanese automaker, suspended its local production for a period of three weeks following the revelation that uncertified employees had carried out final inspection checks of vehicles for decades. It started its production again on Wednesday, at all of its six domestic assembly plants. This saga is just the latest of a series of cases of misconduct that has involved manufacturers in Japan including the falsification of data scandal at Kobe Steel. Mitsubishi Motors in 2016 admitted to falsifying test for fuel efficiency on some of its models. While costs that were related to the scandal over safety are expected to hurt annual profit at Nissan, there were other headwinds that weighed on quarterly earnings. Nissan operating profit was down to 128 billion yen during the three-month period to September, in comparison to 163.9 billion yen for the same period one year ago. The result came up short of Wall Street expectations and came as its sales dropped by 2.2% in the U.S. market that continues to become increasingly more competitive. On Tuesday, Japan’s biggest automaker Toyota, announced that its sales for North America fell to their lowest point in close to three years. However, Nissan did fare better when it came to sales that were closer to home. Its sales in China were up 8%. China has become the largest car market in the world. Sales in its domestic market of Japan were up by 25.6% during the three-month period.